Stop wasting time looking for Sunday school activities! Don't spend another weekend frantically looking for suitable Sunday school activities for your upcoming class! Children's Worship Bulletins are full of games and puzzles about nearly every part of Scripture you want to teach. In this short article, we'll show you how easy it is to create Sunday school activities about giving from two of our bulletins. Want to know more? Scroll down to learn about our 50% savings offer too! Give each child a bulletin, a pencil and some crayons. Have the children complete the puzzle "Rejoice in all the good things the Lord has given you" while you read aloud Deuteronomy 26:1-11 to the class. Give each child a copy of the fruit in a basket picture. Allow the children to color their full baskets of gifts from God. When the children have finished their baskets, ask a volunteer to show their basket to the class while you review the gifts God has given us. Explain the activity, "We're going to learn about giving to God by seeing how quickly you can solve the puzzle in our bulletin today. When I yell, 'GO!' we will work on solving 'When the Israelites entered the land God was giving to them ...' The first person to finish their puzzle will win a prize." Yell, "GO!" and wait for the first child to finish their puzzle. Have the winner read their answers to the class. Award prize. Like the example activities we've provided in this short article, Children's Worship Bulletins are available for ages 3-6 and ages 7-12. Each bulletin is packed with fun puzzles, word games, dot-to-dots, seek-and-finds and more bulletins to teach and inspire children to cherish Scripture. There are thousands of Children's Worship Bulletins organized and searchable by Scripture reference, topic or lectionary reading. With so many choices, you'll be sure to find exactly what you need for your next Sunday school class. Plus, we're adding more content all the time! Put Children's Worship Bulletins to the test by signing up for our 30-day, no obligation risk-free trial period, and see for yourself! 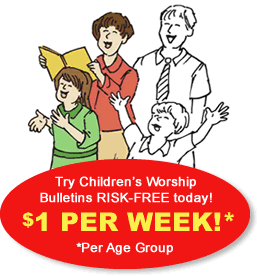 That's right, for one month you can download and print bulletins to share with your children. At the end of the month, you can either cancel and owe nothing or send in your low payment of only $4.99 a month per age group to continue enjoying all our bulletins! You have NOTHING to lose!